Happity is on the shortlist for an award in the category “Best use of technology or innovation within a family-friendly business” (sponsored by babyballet) – in recognition of businesses who make use of technology to promote flexible working. Ever wondered if you could retrain to find a job that fits around your family? 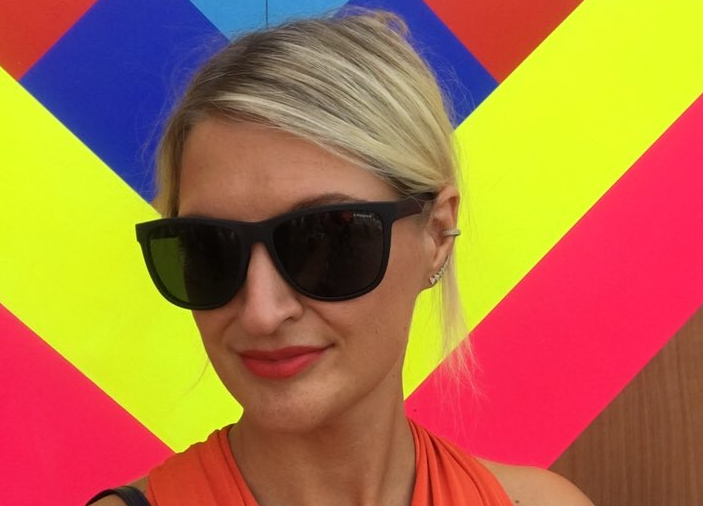 Meet Lucy, a Digital Mums student who’s just completed the Social Media Marketing Associate programme in order to do just that. Anne-Marie Martin is founder of diddi dance – funky pre-school dance classes for girls and boys aged 18 months to 4 years. diddi dance runs nationwide with 40 franchisees. As if that wasn’t enough, Anne-Marie also masterminded the creation of Under 1 Roof, a venue which hosts a wide range of services for young families in South East London. We met this inspirational mum of two to find out about her journey and how she juggles her businesses alongside family life. We love hearing about inspirational mums who have made the brave move to leave their old career and start a business. This week we’ve been talking to Annie Baker, founder of Abbey Wood Yoga, who lives in South London with her husband and daughter. She couldn’t find an affordable yoga class and so set up her own – using her daughter’s nap times to do it! I have always enjoyed Yoga and hadn’t been able to find any affordable classes nearby. Organising my own classes close to my house meant I had no excuse not to attend! This was also a great way to meet new people in the local area after my husband and I moved here from Finsbury Park in 2016. I hired a local teacher and space and posted on a local Facebook group. I was fortunate enough to have a large group of enthusiastic students at my first class (35 students turned up, which was a great start for us). I started off by setting up the business whilst my daughter had naps and after she had to gone to bed. It was a mad rush to get things done initially. She now goes to a childminder twice a week – this gives me to time to have meetings and attend various educational conferences. Abbey Wood Yoga brings together talented local teachers and local spaces (like the beautiful ruins at Lesnes Abbey). They are open to anyone, even those with no previous yoga experience. Our classes are all affordable and we offer flexibility. We don’t have a specific studio space, but we benefit from a variety of different spaces, such as Under1Roof in Woolwich, and the beautiful newly built lodge at Lesnes Abbey. What’s your greatest success to date? My greatest success was expanding the business very quickly over a few months. 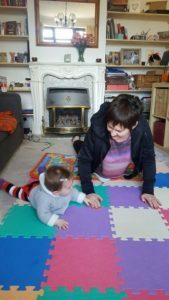 I started out with one weekly class, and it quickly grew to 3 weekly classes, beginner workshops and Mum and Baby Yoga courses. I have also brought together a community of students that help and support each other. 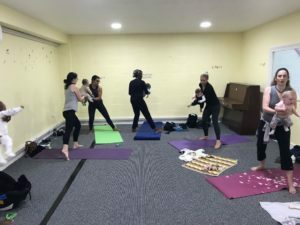 The Mum and Baby yoga classes bring new mums together in a comfortable and fun setting and they quite often catch up afterwards at the Under1roof cafe. This is ideal for Mums and Babies, from the Mum’s GP check until 6 months after the birth. 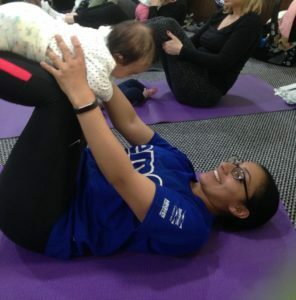 The classes are a wonderful opportunity for new mums to ease their way back into exercise after the birth of a baby. Yoga helps to stretch, strengthen and tone your body. The biggest challenges are shutting myself off from the business and allowing myself time to relax. I often have ideas or impulses to create new things just as I am about to fall asleep. Having a happy calm mother is crucial to the development and well being of a child even in the early stages. 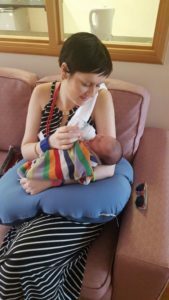 How does your class benefit mums and babies? The benefits are twofold as we offer both adult classes and the Mum and Baby yoga sessions. Yoga is fabulous for restoring your sense of well being – whether you are returning to it, or are a total novice. It also helps to strengthen and tone your muscles, especially abdominals, pelvic floor and back. The sessions include gentle yoga for your baby so you can practise together, helping you to engage and bond with your baby, and imrpove understanding of their development. Breathing exercises aid with increasing calm and confidence – and yoga can even improve your sleep! Having a happy calm mother is crucial to the development and well being of a child even in the early stages. The classes are adapted for the post partum mum’s body, and we provide exercises and modifications for each student. How do you juggle work and life? This is something I am still working on. Being efficient and learning faster ways of doing things helps save time and offers a better customer experience. For example, I implemented an online booking system quite early on. There was an initial investment in time and money, but it paid off in the long run. Also saying yes to help that is offered. A student offered to build me a website as I didn’t have the time, She had just completed her studies and so this was a great addition to her portfolio as well as being very helpful for me. What skills from your former career have been the most transferable? I previously worked as an executive assistant and have worked in a variety of companies, including Google, American Express and Cancer Research. These were all very different companies, but the varying cultures helped me adapt to change quite quickly. My primary task was organising the lives of others and arranging team building events, my experience of doing this directly helped me to gauge whether venues would be right for a class. As an executive assistant things can go wrong very quickly and you quite often have to deal with difficult or stressed staff. It helped me develop resilience and I have learnt to communicate with people across the board. Getting a good night’s sleep is the one thing that can help me stay focused. This isn’t always possible with my baby girl, but we are getting there. My husband is incredibly supportive and helps me see things from different perspectives. My biggest challenge in the beginning was an overwhelming feeling of sadness and fear of being alone. It is vital to look after yourself and your own health, particularly your mental health. My biggest challenge in the beginning was an overwhelming feeling of sadness and fear of being alone. By forcing myself to go out to local children’s centres and mum groups, I slowly started meeting new friends. It can seem challenging in the beginning, but forcing yourself to get out the house is the best thing you can do for both you and your baby. Everyone has an opinion about what you should be doing, but you will instinctively know what is right for you and your child. Also, if someone offers help, say yes to it – just having some time to yourself will help invigorate you. 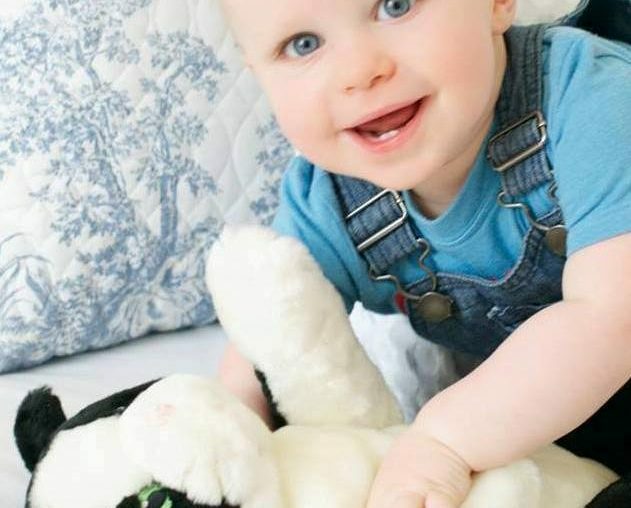 And finally… what’s your favourite baby class or activity (your “Happity Hero”)? Abbey Wood has a hidden gem called the Toy Library at 47 Abbey Grove, SE2 9EU. It is a playgroup with a multitude of facilities, like a jumping castle, ball pit, sensory room, soft play and toys for children suitable for children of varying ages. It runs every Tuesday morning. They have the best sensory room I have ever seen (it even has a waterbed!). It costs £1 and includes a hot drink and biscuits for the parents and healthy snacks for the kids. It is currently being funded by charity donations and if they can get more funding there is the possibility that they can open an additional day. Take a look at our schedule and book a class at Abbey Wood Yoga. Visit Happity to find out more about Abbey Wood Yoga. Happity is a big list of little activities helping you to search for and find the right baby or toddler class near you. Whether you’re looking to entertain your little one or want to go somewhere you can meet other parents, we’ve got all the info you need to get out and about. Fast. We’re turning the spotlight on the three inspirational mums who have successfully built up their Sing and Sign franchises in South London whilst juggling family life. Kim Golson has kindly agreed to spill the beans on herself and her fellow franchisees Trish Cummings and Rebecca Clow. We’re also delighted to have them as partners in our #findyourhappity competition which you can enter now! As parents, we’ve all struggled with the juggle. For many of us, trying to find #workthatworks is a major hurdle to feeling in control of family life. In this series, we’re shining the spotlight on inspirational and resourceful parents who’ve ditched the 9 to 5 and started their own business. This week we’re featuring Charlotte Endacott, who set up the East Dulwich franchise of Gymboree six years ago. Gymboree East Dulwich is one of our fabulous partners in the #findyourhappity competition which you can enter right now! Plus read on to find out how you can get a discount off your first month’s membership in October 2017.